← Ask DART: Buses roaming the streets in … Mississippi? The most challenging part of DART Police Department’s use-of-force simulator isn’t the heart-pounding scenarios, or split-second decision making with a suspect that may be pulling out a wallet or a gun, it’s the calm conversations faced after the scenario is complete. “That’s somebody’s son you just killed. How are you going to explain this to his mother?” asks DART Police Sergeant Donovon Collins. DART Police officers have all of the rights, privileges, obligations and duties of peace officers in the state of Texas—meaning they have the power to arrest, serve arrest warrants, issue citations, search and seize and file criminal charges. Use-of-force challenges—knowing when to use words instead of weapons—are also part of the job. DART is using its own use-of-force simulator that puts officers in the middle of possible real-life scenarios where the use of force may be required to help prepare officers for those difficult situations. The simulator has been in use since January. The simulator, which was developed by TI Training Corp, places officers in different scenarios and gives the ability to exercise a variety of different force options including pistols, TASERs, batons, pepper spray and verbal commands. “This is about as close as one could get to the street,” said DART Chief of Police James Spiller. 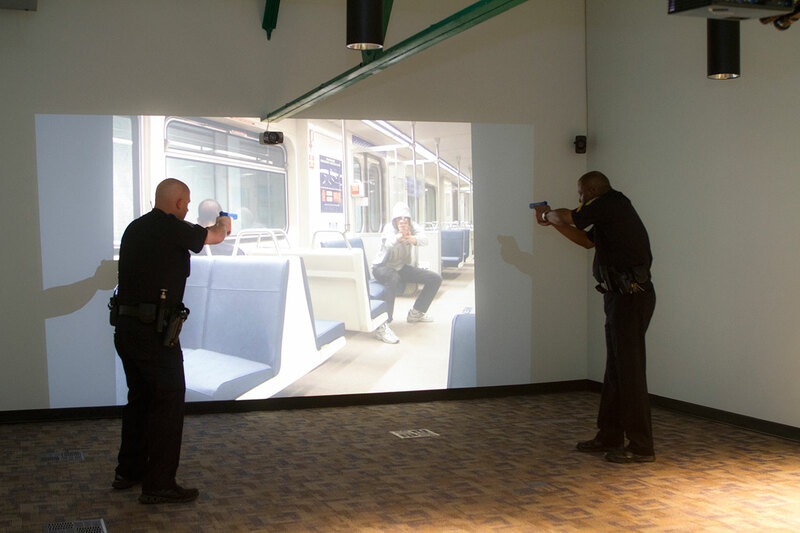 Before stepping foot inside the simulator, or even on the street, all DART police officers train on pistols and other uses of force (baton, TASER, pepper spray). Twelve days of the police academy is spent learning about these tools and the tactics and decisions that they require. The simulator is housed inside DART Police headquarters at Illinois Station. For safety, officers are required to check their duty weapons at the door before being armed with simulation weapons inside. 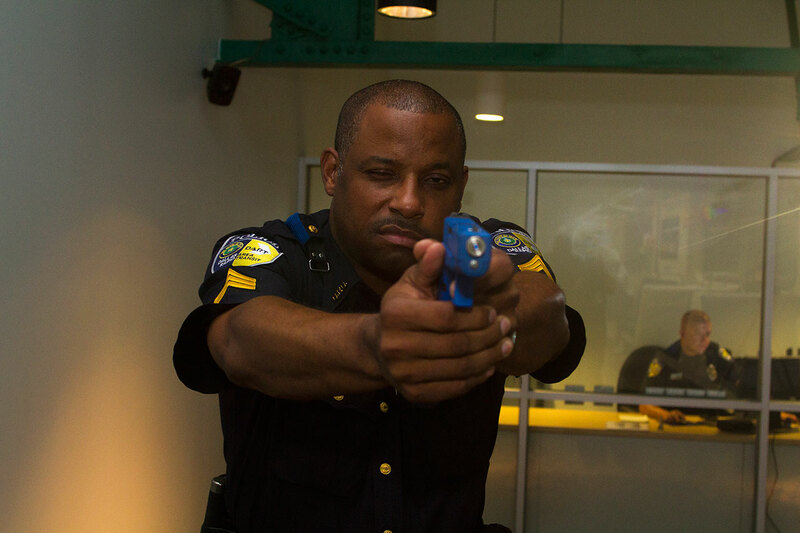 DART Police Sergeant Donovon Collins aims at a suspect in the use-of-force simulator. Ignore the visions of plastic, video game weapons. The pistols and tactical tools are identical in size, weight and feel to the real-life counterparts. They have just been modified to interact with the digital system. Once inside and armed, officers are given instructions from a simulator operator. These instructions, which may be very specific or broad in nature, are similar to those given by police dispatch. From there, the scenario begins and officers are instructed to participate in the scene projected on the wall as normal. This includes shouting commands, listening to what bystanders may be saying, drawing a weapon and firing if deemed necessary. A simulator operator can adjust the scenario on the fly resulting in different required actions and outcomes based on the officer’s actions. Each scenario is different and can end with a suspect complying, with a use of force exercised or even an officer being injured. What remains the same is the post-scenario questioning by a senior DART Police member. DART Police officers complete more than 20 hours of training every two years on all aspects of the department’s use of force continuum. Elements include verbal de-escalation, defensive tactics, weapons qualifications and use. DART police officers go through simulator training and evaluation once every two years. They are required to re-certify in pistol training twice per year. It is always the aftermath that leaves yourself feeling guilty. I think jobs as sensitive as this should have regular training to ensure they have the proper state of mind when they do experience it firsthand.